Measuring the integrity of gas pipelines and chemical storage vessels requires the use of dedicated equipment that is able function in a variety of conditions. By assessing materials for damage and corrosion, operators can ensure the safety of pipelines and increase the life of storage vessels. For many years the range of Cygnus Ultrasonic Thickness Gauges have been utilized by civil engineers and safety inspectors to monitor corrosion levels within a large range of applications which include storage containers holding hazardous materials, and gas and oil pipelines. Frequent inspection and maintenance of equipment used in these applications alerts inspectors to a change in the metal thickness and thereby allows them to determine the level of corrosion. Obtaining this information at an early stage not only reduces the possibility of damage to the structure but also ensures the safety of staff, etc. When corrosion occurs, the likelihood of further damage or leakage can pose serious risks to plant operators. Frequent and accurate assessments with corrosion thickness measurement gauges are therefore vital components of these operations. The materials' thickness is measured using Cygnus pioneered, multiple echo technology. That is, a short pulse of ultrasound is sent through the material being tested. The thickness gauge measures the time between the 2nd, 3rd and 4th echoes to determine the metal thickness, ignoring any external protective coating. This method therefore eliminates the need to access the interior of a vessel or structure, to obtain an accurate thickness measurement. Cygnus UT gauges are used in the maintenance and safety checks of metal thickness for chemical plants, storage tanks, pipelines, grain processing plants and many more industries. They have designed their thickness gauges to operate in a variety of working conditions, from lightweight hand-held gauges to heavy duty underwater gauges for research and testing – all of which collect the critical data required to measure material thickness and determine corrosion levels. The maintenance of bridges, cranes, and railway infrastructure all require frequent assessment to ensure levels of corrosion are safe and acceptable. Ultrasonic thickness gauges are able to measure through paint and protective coatings up to 20mm thick, depending on the model selected. 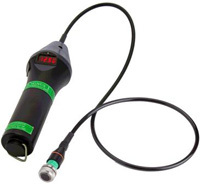 These gauges are ideal for use in harsh environments and can also provide for hands free use, which is best suited for operators needing to perform multiple tasks while surveying. Oil and gas pipelines often experience internal corrosion that can lead to dangerous leaks that require emergency repair. This type of damage is costly and dangerous, and could often be prevented if the pipelines were surveyed on a more regular basis. The benefit of using ultrasonic technology is that it's a simple and fast process that can be carried out by a single engineer. Most industries contain some level of hazardous material which must be properly maintained for safety. These could include chemical plants, fuel depots, and mines. The condition of chemical storage vessels determines whether leakage of hazardous materials into the environment will occur. Cygnus Gauges are designed to work in harsh environments such as these and can help ensure the safe containment of toxic substances. Offshore structures generally operate in harsh conditions, and many underwater pipelines will have a protective coating as a result. Gauges measuring these materials must be able to ignore these coatings to provide an accurate thickness measurement. Previously, thickness gauges on the market utilised only a single pulse, thus including the coating thickness in the measurement which resulted in an incorrect material thickness reading. Ultrasonic thickness gauges make it possible to avoid removing protective coatings, making the entire procedure of structure maintenance a far more simple and efficient process. Leaks are a constant threat to the function and safety of pipelines and chemical storage vessels. Pipe seals and fittings are subject to wear, and bearings with rotating parts must be monitored for early wear. Ultrasound is produced with the friction and leaking of gases, so by using the ultrasonic thickness gauge to measure the intensity of the detected ultrasound, engineers are provided with a more accurate view of the materials' condition and severity of the leak. The contents of storage tanks can often mean there is a high risk of corrosion, and the surrounding environment can pose a threat to the tank's supporting material. Propane gas cylinders and water storage tanks can both benefit from routine maintenance of their containers. By inspecting high risk, hazardous materials storage containers and pipe work, operators can monitor the potential for damage or safety concerns resulting from corrosion and wear from the environment. Ultrasonic NDT gauges allow these structures to be assessed regularly, with ease and accuracy, obtaining data for future evaluation. With the full range of ultrasonic measurement devices we design and manufacture, we have a suitable gauge to meet the demands of almost all industries, for both above the surface measurements, as well as subsea and underwater thickness measurements too. Long-term regular maintenance is an essential part of owning a business, taking into account both worker safety, and avoiding costly emergency repairs, or worse! Preventative measures such as ultrasonic thickness testing will benefit those industries that rely on continuous operations in spite of the risks involved.